What could have been a procedural blip in court on Friday now may be one of the most anticipated courtroom dramas of the year, as Paul Manafort's legal team and the special counsel's office prosecutors go before a federal judge to explain how his cooperation agreement blew up in recent weeks. It also comes as President Donald Trump refuses to rule out a pardon for his former campaign chairman and one day after Trump's former personal lawyer Michael Cohen pleaded guilty to lying to Congress. Friday's hearing is meant to set the schedule for Manafort's sentencing. His attorney said Manafort plans not to attend the hearing Friday, which is an unusual decision among criminal cases but is within his legal rights. He is currently in jail in Alexandria, Virginia. While he still claimed his innocence in the case, prosecutors indicted him for attempting to contact potential witnesses to shape their stories. He then went to trial in Virginia federal court, holding off prosecutors from making a deal. After he lost his case at trial, Manafort changed his plea and agreed to cooperate with investigators. But that cooperation now appears to be tainted with the lying accusation -- another unusual turn of events. Jackson has been a harsh critic so far of Manafort's legal maneuvers. She reprimanded his work ghost-writing an op-ed for a Ukrainian newspaper about himself after his arrest, and she denied every request he made to challenge the legal underpinnings of his indictment and Mueller's approach. She also revoked his house arrest in June, sending him to jail because of the witness tampering accusation. Jackson has also taken issue more than once with Manafort's lead attorney, Kevin Downing, after he grew impassioned during court proceedings and raised his voice. She placed a gag order on the case in its early days after Downing spoke to cameras outside the courtroom defending Manafort and President Donald Trump. Jackson has repeatedly warned Manafort's lawyers and Manafort that they should not play politics, especially in the media, as a way to influence the case. "Other people can talk about the case ... but when those events become orchestrated or entangled, that's where the risk is of crossing the line," Jackson said at a hearing for Manafort and his deputy Rick Gates earlier this year, while they both still sought jury trials. Downing took another unusual step in recent months -- of communicating with the President's legal team about Manafort's cooperation sessions, according to the President's personal attorney Rudy Giuliani. 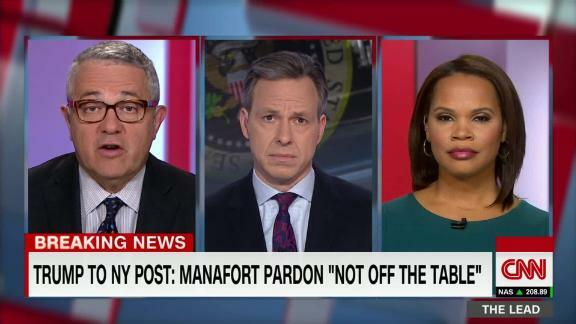 Trump has said recently a pardon for Manafort is not "off the table," raising questions about whether Trump telegraphed to Manafort to end his cooperation. It is possible the judge will not only revisit Manafort and his defense team's past missteps in court Friday. She could also ask the lawyers on both sides to discuss in more detail the circumstances of his recent alleged lies. Prosecutors simply said earlier this week that Manafort "breached" his agreement by lying "on a variety of subject matters." They said they would give the judge more details at a later date, before his sentencing. If Jackson agrees that he broke his deal, Manafort's likely sentence in the DC case is between 17 and almost 22 years in prison, according to his plea agreement. He will be sentenced separately in February for his convictions in Virginia.